I suppose that folks grow weary of cloudy skies and refreshing rainfall the I way I grow weary of glaring sunshine and hot blowing dust day after day. But today’s outing was especially delightful for me. Slightly cooler air came sweeping into north Texas early this morning. More importantly, the skies were cloudy and rainy. 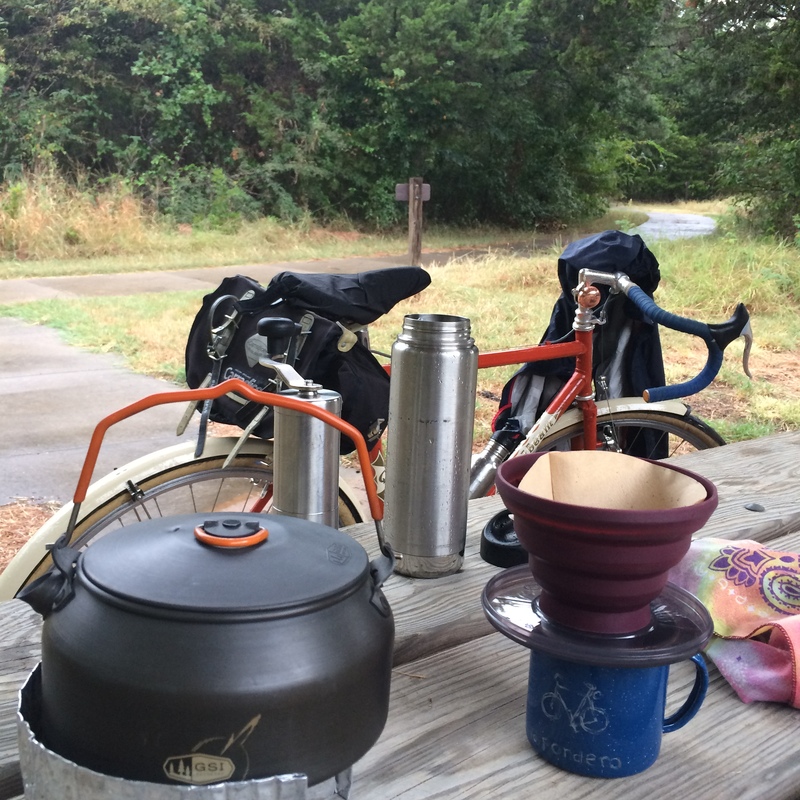 I rode out to the “just now re-opened after the May flood” State Park for a fresh cup of coffee in the woods, and I was able to use some of my gear that I rarely use. My rain shell keep my body comfortable in hours of showers. My saddle cover kept my leather saddle dry, and my fenders kept the spray off my backside. It’s still late summer in Texas for a few more weeks, but it was mighty refreshing out there today. Glad you got to enjoy the cool rain. My last rain riding experience (about a week ago) ended with me looking like a “drowned rat”! In spite of that, it actually was quite refreshing! I’m sure I’d get tired of rain, but I really had a great time. Very nice post. Was doing a ride last month and it turned nasty looking. Local county police officer drove by me and said to take cover. A bad storm was coming. Got caught in a bad wind and rain storm. Springfield,MO. Thanks…we did have some thunder and lightening, but it seemed to happen when I had cover and coffee. So I lingered a little, geared up, and headed back out into to a relaxing steady rain for the trip back. Worked out fine. Interesting. I was thinking about how nice it was to have fenders on such a day. I figured in the PNW, I’d be encouraged to ride more often in rain like I do here in heat. The cat analogy is perfect. I think I know exactly what you are talking about. Nice to ride in summer rain, Chris. Our temps are dropping and the rain is getting a bit colder here. Still haven’t used the cape yet. Managing without it and getting really soaked for the heck of it, sometimes. Thanks, Chandra. Since it wasn’t cold, I was able stay quite comfortable all morning long. I suppose I am often wetter during my sunny day rides.